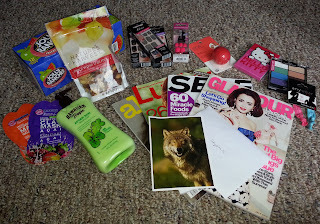 Jolly Rancher Freezer Pops, Maui Wowi Trail Mix, 3 packs of Kiss Nail Dress, Impress Press-on Manicure, Any Wear Hair, EOS, Hello Kitty Memo Pad, Wet N Wild Eyeshadow, Freeman Clay and Hydration Mask, Hawaiian Tropic After Sun, and 4 magazines Glamour, Self, Lucky, and Allure! This package was amazing, she went above and beyond my expectations! I love everything and my daughter's loved the Jolly Rancher Freezer Pops!!! Thank you Martha for all this great stuff, I'm so happy I made a new friend. I absolutely LOVED my package! How fun! That is a cool way to do a swap with a fellow friend/blogger. Love it! What a fun idea - I want to do something like this! It was a blast, I hope she does her Holiday one!